Here at Petigree, we firmly believe that responsible, transparent dog breeders are the best positioned to make a significant impact on the ongoing struggles the industry is having. That is why we are focused on arming them with the tools necessary to highlight their skillset and reputation. In doing so, we believe that future pet owners will be able to better distinguish a responsible breeder from one that is not. 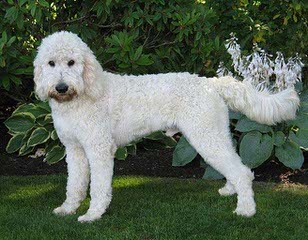 Royal Minidoodles are premier breeders of English Cream Minidoodles. CKC registered. Goes home with puppy pack, utd vaccinations, health check, registration papers. Raised in home as part of the family. Can meet for delivery. Ready February 14th. We are a family owned and operated kennel. All of our parents are of champion bloodlines and are fully health tested (hips, eyes, etc.) 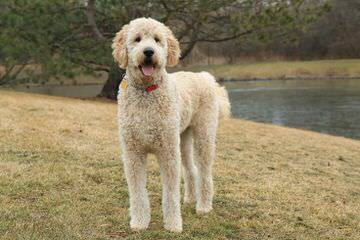 We breed large breed hypoallergenic dogs such as the Newfypoo, Goldendoodle, Bernedoodle and Irish Doodle. 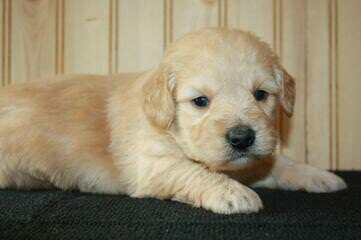 Searching for a STUD AKC/CKC registered Goldendoodle, Golden Retriever or standard poodle for stud. She’s ready now! 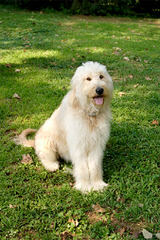 We raise beautiful CKC Goldendoodle, AKC Standard Poodles, and AKC Old English Sheepdog. We are located in Morehead, Kentucky 40351; a small town known for Morehead State University, Cave Run Lake, and the Daniel Boone National Forest. 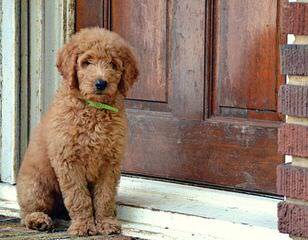 We are able to produce both solid and parti-color Goldendoodle and Standard Poodle puppies. 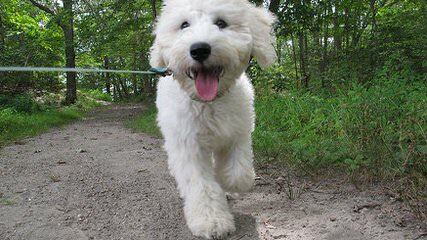 Our Old English Sheepdog are the traditional Old Fashioned Sheepdog color and markings. They are an awesome calm and loving breed! Visit our web site and take a look around. If you find something that catches your eye give us a call! 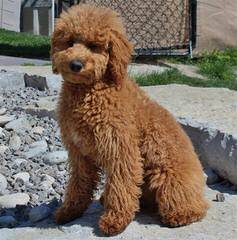 We are currently expecting a mahogany red litter of AKC Standard Poodle Puppies about August 21, 2015. 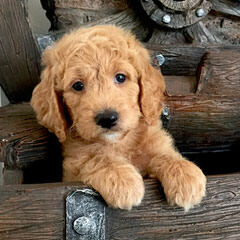 We have a couple of our parti-color puppies availble…one female and one male. Both puppies are dark chocolate/brown and white and come from UKC Grand-Championship lines. We strive to produce the best looking, healthy puppies possible and it shows. Call (606) 784-9080 to place a deposit or to make a purchase of one of our beautiful puppies. While on our site please take a look at our Guarantee-Contract prior to calling to place a deposit. Thank you. 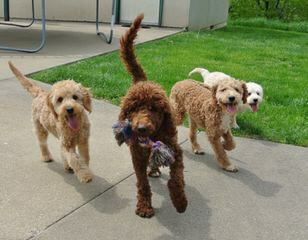 Multi-generation standard Golden Doodles. Many colors, Red, Apricot, Chocolate, Black. 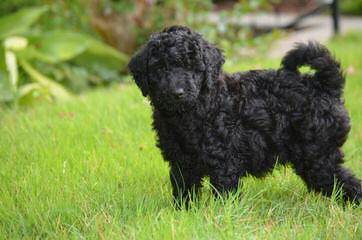 Our puppies are selectively bred to consistently produce quality goldendoodles with sweet, loving and very friendly temperaments and soft, wavy to curly coats. Our goal is to offer superior companion and service dogs to loving families. We are state licensed and vet recommended. 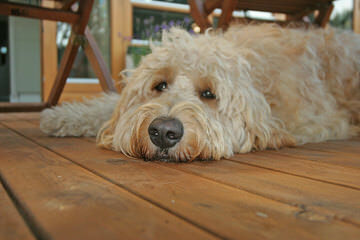 At kydoodles.com we are a small family breeder of Goldendoodles and Labradoodles. All of our puppies are home raised and super well socialized. From the moment of conception our puppies receive the very best care (excellent nutrition, prenatal veterinary care and pregnancy massage for the moms). 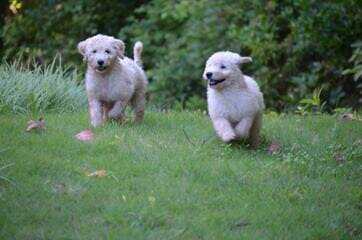 Our labradoodle and goldendoodle puppies are super well socialized and make the transition easily from our home to yours. 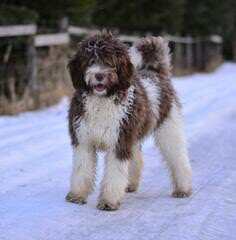 Experienced breeder of Standard Poodles, Goldendoodles and now, Bernedoodles. Health, temperament and beauty is what we strive for, so that you will have a new “Best Friend” for many years!! Our parent dogs are carefully chosen, we not only do lots of health testing on our dogs but also pay close attention to our pedigrees. 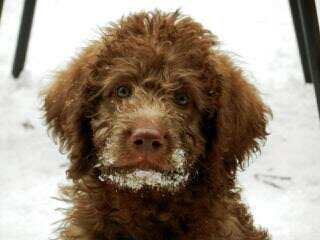 We love color in our breedings and specialize in multicolored pups….parti’s, phantoms, sables and tri-colored!! 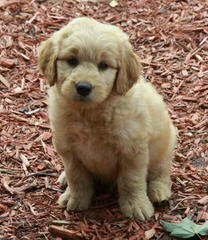 Of course, we still have solid pups available in all colors…….golden/apricot, cream, red, black, chocolate! Our pups come with a health guarantee to 2 yrs. of age, microchipped, vaccinated, dewormed and spayed/neutered. Visit our website for many pictures and lots of information! Stone Creek Doodles is located on our family farm in Southwest Idaho. We are dedicated to raising only the best of the breed. 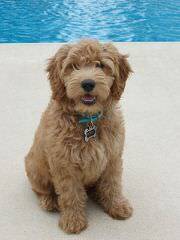 We are very excited about Goldendoodles and Labardoodles because we truly love Labs, Golden Retrievers, and of course Standard Poodles! 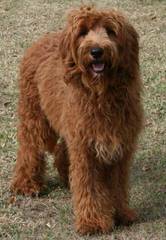 Combining these outstanding breeds has resulted in perhaps the “Ultimate” dog. 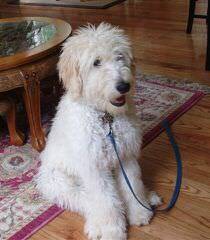 Our first doodle “Cash” quickly stole our hearts and we suddenly became obsessed with doodles. All of or dogs are loved and part of our family. Each dog is kept current on all vaccinations and worming, as well as regular vet visits. We are blessed to live in a secluded area on the edge of a creek. Our dogs are provided with plenty of opportunities to swim with lots of room and time dedicated for exercise and fun. It is a priority to us that all puppies are well socialized and well loved when you receive them. Please call or email with any questions or to schedule a visit. 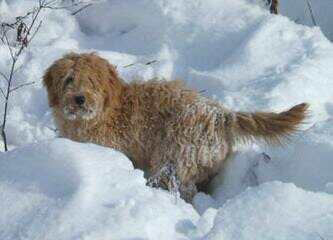 We are F1 Golden Doodle Breeder located in Kentucky. Were a family owned busniess. We have beautiful deep reds and browns in our lines . As well we have parti-colours in the brown and white, apricot and white and red and white. Our puppies are all over North America as well as the British Isles and Europe. 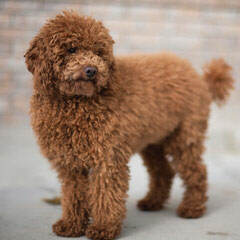 Mimi’s Labradoodles Chocolate and Cream and Red . from the moment they are born. Our puppies are in home raised. They come from health tested parents and are guaranteed. We have gorgeous apricot, black and reds for sale.They are non-shedding and hypo-allergenic F1B’s.Please visit our website for more information and feel free to call with any questions you may have. 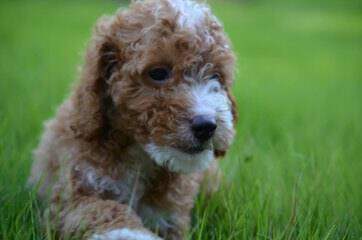 We breed quality mini goldendoodles and miniature poodles. 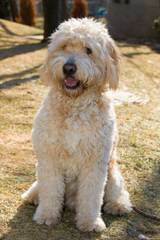 Our dogs have excellent pedigrees and great temperaments. We raise them inside with our family and give them lots of TLC! They are socialized around kids and other pets. They are fed high quality food, vet checked, wormed on schedule, and vaccinated. We get the puppies started on potty training early so that their transition to their new home goes smoother. 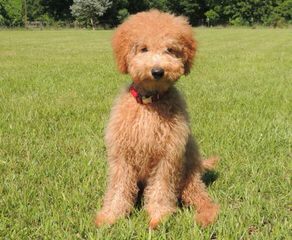 Here at Rainbows End Puppies we take great pride in providing you with a Goldendoodle puppy that will give you many years of loving companionship. 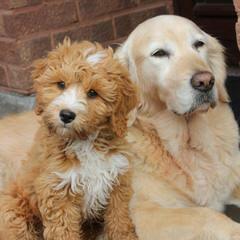 Our parent dogs are all held to high standards when it comes to temperament and health. We have no kennels. Our dogs and puppies are raised and loved inside of our home. *Are handled by our children and us from the day they’re born on a daily basis. *Are potty trained while they’re here. *Will come with a New Puppy Kit, which includes enough of their puppy food to get you started at home and a detail of all their health care information. *Your puppy will be wormed and comes with first shots. *Are loved loved loved by us their “foster” family till they go to you- their forever family. We raise our puppies in a complete family environment. 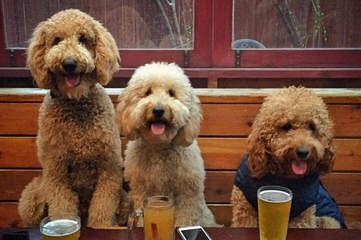 We are not a kennel but a family who breeds Golden Doodles. All our dogs have their OFA/cert. Puppies are de-wormed every two weeks until adopted. All puppies get a clean bill-of- health with all vaccines by my veterinarian before adopted. 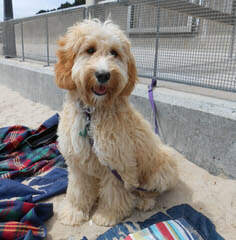 Puppy parents must sign a contract which I have posted on my web site. We breed for F1b’s and F2b’s which are known to be even better for people with allergies. We are located in Norther NJ. All of our dogs and puppies are raised in our home with much love. I believe the 1st 8 weeks of how a puppy is raised is most essential for the rest of their lives. As a small breeder, I can be very choosy about our puppies “Forever Homes”. I want our puppies to be just as spoiled and loved once they leave us if not more. 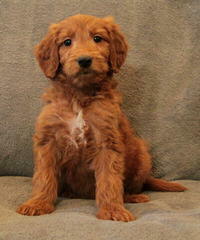 Our goldendoodle puppies are hand raised in a loving home with children. 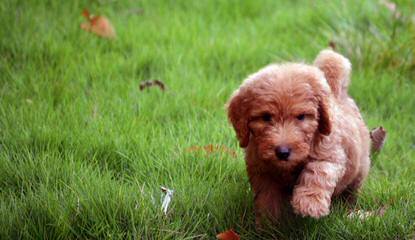 We have white, cream, buff, apricot and red golden doodle puppies. 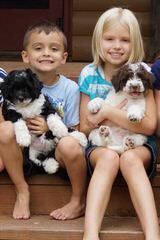 We offer new families to bond/visit with puppies while they are just babies. This is beneficial to the puppies as well families with small children. Check out our website. 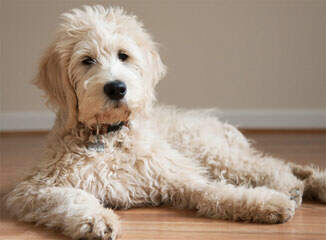 We raise Standard and Mini English and Classic Goldendoodles. 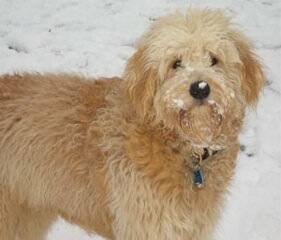 We also have Saint Berdoodles at times. 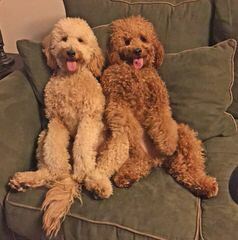 Here at My Doodle Darlins we are devoted and loving breeders of Top Quality Goldendoodles.Our puppies come with a 1 year genetic health guarantee and a lifetime of support. 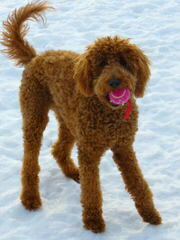 We offer our Goldendoodles in several sizes Mini Petites, Miniatures, Mediums and Standards. We also offer many colors to choose from Creams, Whites, Apricots and Reds. We also offer rare colors Phantoms, Sables and parties. Our babies are handles and loved on from the second they are born. I have been a breeder for 14 years. 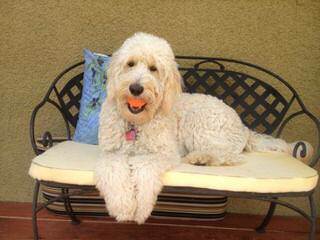 My adults here at My Doodle Darlins were raised from puppies. They were chosen for my breeding program due to their good Genetic Back grounds, easy going temperaments and loving personalities and excellent conformation. We breed only Top Quality dogs to produce top quality puppies. 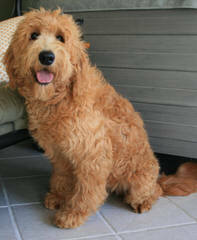 Quality, happy, healthy Goldendoodle and English Teddy Bear Goldendoodles raised in loving, family-owned kennel. 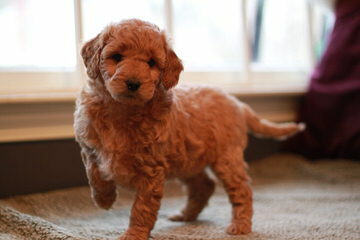 We also raise mini goldendoodles. Puppies are all handled and loved from birth and vet checked. 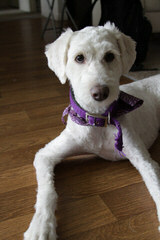 We are vet recommended and state licensed. We love our dogs and it shows! 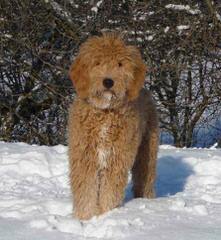 We generally breed Goldendoodles but have a litter of Shepadoodles at the moment. These pups will be ACH club registered. Looking for great places to advertise them. We are a small in-home breeder…averaging 2 litters a year. 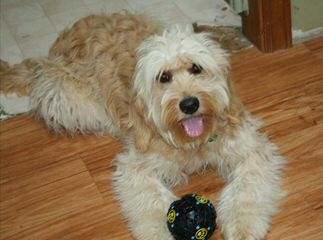 We breed beautiful mini goldendoodles. Parents health tested and puppies get a 2 yr. health guarantee. Carriage House Cockapoo and Goldendoodle puppies is located in the beautiful Shenandoah Valley of Virginia. 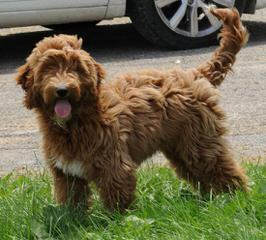 We are dedicated to raising quality Cockapoo and Goldendoodle puppies with over 15 yrs of breeding experience. We do not have a kennel based program. We are purposefully small so that all of our dogs can be raised in our home as part of our family. Our moms are never alone during labor and delivery. The puppies are handled with love and care from the moment they are born. All puppies come with a one year health guarantee and a lifetime of support.